Bing dictionary defines a blog as an “online diary on a web site; a frequently updated personal journal chronicling links at a web site, intended for public viewing.” The word book has more than ten definitions, but one that closely mirrors the definition of a blog is, “an imaginary record, archive, or repository of knowledge.” The modern book comes in many shapes and sizes. In today’s Internet-saturated world, it’s nearly impossible to enter into conversation about mom blogs without considering the implication these entries have in a larger book context. The stories on various blogs influence one another and the difference these blogs are making in women’s lives is unlike the power stories have had at any other point in history. For the most part, a mom blog chronicles the trials and tribulations of motherhood. Over the last few years, however, mom blogs have evolved into something more. Writing women, who happen to be mothers, have turned to blogging for more than space to share diary entries. The inter-connectedness of writing, life, motherhood, and growth means the stories on one blog are invariably tied to the stories of many others. It is a complex story, and each day a new chapter is written. Dandelions brought me into Elodie’s blog. It was spring 2010, and I had been overrun and exhausted by the dandelions in my yard. That… and my children, I suppose. I couldn’t keep up with either of them very well, and as was my mode of distraction, I regularly hunted online for smart writing with which I could identify. I cannot tell you word for word the blogpost that started to change my story, only that what Elodie shared on her blog that day resonated so completely with me. We were living lives, and though I had been thinking which words would best capture my story, she happened to be the one to write it down that day. I commented on her blog about my connection to her writing and asked her about how she came to the decision to write about dandelions. “I was writing for the Momalom challenge,” she explained. “Momalom? What’s Momalom?” I asked. 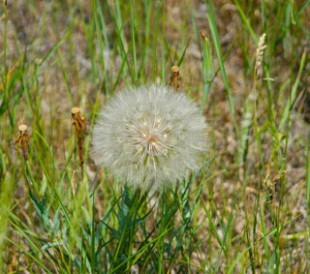 Dandelions survive because their seeds are carried across the wind to land in the space where they can grow and thrive. So perhaps it’s no mistake dandelions linked us together that spring. Moms live in a world where the thoughts and words that define us sometimes never have the opportunity to leave our mouths and when they do, they often land on inhospitable soil. It’s a world where trains of thought are constantly derailed and completed sentences are a luxury item in an economy flooded with “Uh-oh!”s and “I want!”s. Thankfully, there’s the blogosphere. Interruptions in real time don’t hamper the conversation in the digital world. The blogosphere is an eco-system of sorts where our words are carried on the air to meet in a common habitat. In this place, we are shaped by all the others growing around us, rooting ourselves in the shared soil and stretching, entangled around each other, towards the sun. Here, voices speak to each other across space and time. We meet in virtual spaces, whispering words to engage the mind, touch the heart, or lift spirits. Momalom was one blog that created an environment where these voices, these personalities, these precious words, could find a place to land. My sister Sarah and I started Momalom first as a place to connect with each other, a place to share the things we spoke about daily—mothering the three young children we each had. We were in the very middle of the muddle of years of gestation, nursing, changing diapers, and marking milestones. And we talked around and around in circles, the whole time searching for a place bigger than ourselves that might offer some kind of support or even acknowledgment that we were far from alone. As fulfilling as it was to be the women keeping alive our precious babies, we were each ready for more. More challenges, more outlets, more creativity. Momalom became our place: the place where we started writing all of the conversations we’d been having. The conversations about life with three children. Our experiences wrangling the toddler while the baby slept, or waking up the baby to get the 3-year-old from school. Our experiences of feeling fulfilled and empty all at the same time. Of having achieved this beautiful motherhood and somehow along the way losing our individual selves. We started Momalom for us. But it soon became a place for others, particularly other mothers of three children, who, we found, also had been looking for a place where they recognized their own lives. It was a gift and a thrill to connect with these women. We recognized each other instantly, and together we were like a field of dandelions. At first glimpse, all the same. And yet, upon further examination, each one at varying stages of growing, being transformed, blowing away to other places. Momalom quickly became the place where these women took root alongside Sarah and me. And we started to hear from its members that our quiet little blog meant something to them. It does mean something to us. Feeling connected is one of the most basic human needs and it’s an overriding theme in the story of humanity. Motherhood challenges everything we have ever known about connectivity. We were previously in charge of our own stories, and we chose to whom, and with what, we wanted to stay connected. Children disrupt connection. They insert themselves into the story with an unpredictable and demanding energy. The dialogue is hard to decipher, the plot is continually shifting, and the choose-your-own-ending option doesn’t exist. Blogs offer women a chance to take back control of their stories. We may not be able to decide where the dandelion seeds will grow, but we can choose whether we encourage the seed-sharing, whether we intentionally grow stronger plants, or whether it’s just enough to know someone else is challenged by dandelions. Last summer, a neighbor down the street had a yard full of kids, who all appeared to be having fun picking thousands of dandelions, one at a time. Creative babysitting maybe? I’m not sure. But it reminded me there are all sorts of ways to think about weeds and kids and life. I came to blog-writing kicking and screaming, much like my two stepdaughters came into my life. I had just started to get used to seeing myself as a single mom to my son, when I fell in love with a man with two daughters. I was a mom again—a mom of three now—but not a mom of three, sort of a mom of three. “You’re NOT my mom!” We jokingly refer to ourselves as “newlyweds with teens,” stars in our own reality show. Has anyone else in this world been crowned the evil queen for loving children you didn’t give birth to? My view of motherhood changed. As I read blogs from other moms who defined themselves by love and forgiveness and not just biology, I gained the courage to accept myself in my new role, even if my new stepdaughters didn’t yet. Biology doesn’t change. But biology isn’t the only thing that defines a family. Meagan gently pulled me into the world of blogging. Other moms and stepmoms keep me there. My yard is mostly green, but I know dandelions will show up in my garden, the rock bed, under the porch. And sometimes, I leave them there. And I remember that dandelions were easy, accessible flowers to pick for my mom. Who put them in a cup of water for the hour they would last. My mom didn’t have a blog back then. But she reads mine now. Modern, writing mothers keep public diaries. They offer up seeds of their lives hoping what they share will catch root and grow the story deeper, stronger, and wider in some way. Maybe it’s a metaphor for motherhood, or maybe it is a better metaphor for writing, but either way, mom blogs (a modern growing book) make a difference every day. All of the women who contributed to this post are writing mothers of three. Elodie Ransley spent her twenties building up a rewarding career only to spend the first half of her thirties being loved to pieces (almost literally) by her three delightful daughters. It’s not always a pretty picture, but she spends her limited free time writing about it and recently started sharing that writing for the strong-stomached. Jennifer Grow lives with her partner, John, and their three children in western Massachusetts. In addition to blogging at Momalom, she is a contributor at Project: Underblog. Meagan Frank and her husband, Paul, have dragged their three children back and forth between the Midwest and Colorado for the past thirteen years. No one has run away quite yet. For Meagan, writing has been her portable sanity. Karen Pavlicin-Fragnito writes blogs, books, songs, and love notes to her husband, Geno, in between swim meets, baseball games, and other mom-like adventures in Minnesota. This article was first published May 2013.